Today is the day for The Secret Recipe Club reveal. This month I was assigned Lavender and Lovage written by Karen. Karen was born in South Africa and grew up in rural Northumbria which is in England. Although she has lived all over the world, she currently resides in North Yorkshire and South West France. Karen is currently writing a cookbook about British food, recipes, customs and traditions. Browsing Karen's blog was a delight. I absolutely love her photography. It makes me feel like they were all taken at an old cottage somewhere. One of the things I love about The Secret Recipe Club is I end up making things that I otherwise wouldn't have. I chose to make Karen's Apple and Dorset Blue Vinny Scone Bread. I substituted Marble Cheddar for the Blue Cheese. I have always read people raving about the combination of Apples and Cheese so I thought this would be a good recipe for us to try out. They turned out amazing! They are very simple to make. The apples give the scones moisture and a slight sweetness although these are not sweet scones. My boys loved them and had some with their lunch. Some of the other recipes I've pinned to try later are Overnight Oats with Honey and Raspberries, Cauliflower Mash and Sticky Roast Chantenay Carrot Medley with Pomegranate Molasses. I hope you will hop over to Karen's blog to see some of her amazing recipes and photography! In a large bowl, whisk together flour, baking powder and salt. Add the cold butter and rub into the flour mixture. Mix in the cheese and apple. In a small bowl, whisk the egg. Add milk and mix. Add this to the flour mixture and stir until you have a soft dough. You may need to add a bit of milk if it is too dry. I added about 1 tbsp more milk. Turn the dough out onto a piece of parchment paper and shape into a round that is 1.5 inches tall. Cut into 8 wedges. Brush the top with some milk. Transfer parchment paper to a baking sheet and bake for 15-20 minutes or until golden. Your scones turned out lovely. I also find myself stretching my culinary limits due to SRC. Now I have to try both versions! Great SRC choice! --Dena, visiting from group B. This sounds wonderful, and your photos are stunning! I love apple and cheese together. I love the combination of apples and cheese, though I've never tried them together in a scone. Sounds like a lovely idea - very keen to try them. I love Karen's blog too - she has some great recipes, so it must have been very easy to choose. Never thought apples could be paired with cheddar! 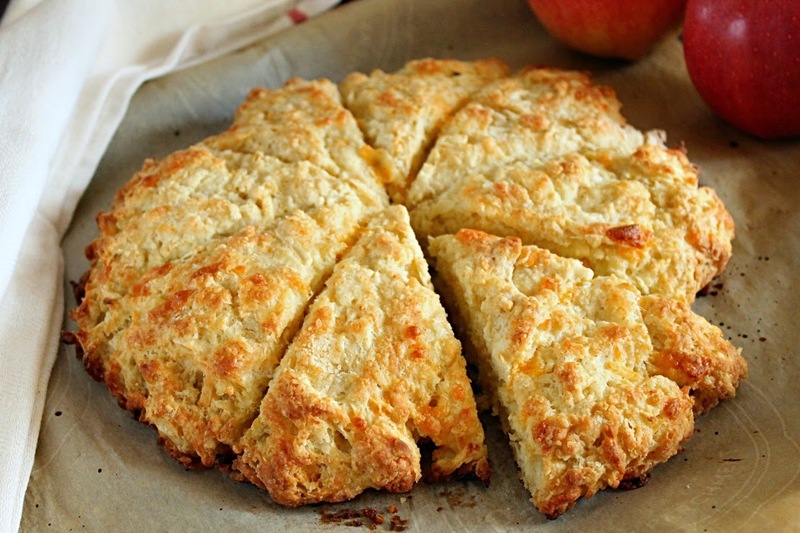 These apple and cheddar scones look so wonderful. It sounds like a great combination. Great SRC post! I've heard some people put cheddar in their apple pie. Beautiful scones and great pick! Terrific looking scones and a nice post.